The mini express car wash system from NS Wash takes up less space and produces less water than a hand wash, according to the company. 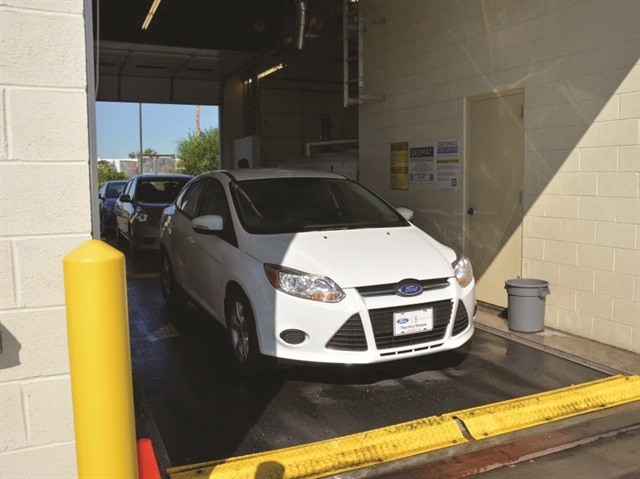 While hand washing is the norm for many rental operators, some prefer to speed up the process by washing vehicles with an automatic car wash. The automatic car wash of choice is the drive through, says Frank Lash, an independent car wash consultant to the auto rental industry. A drive-through unit consists of a curtain or top wheel to clean horizontal surfaces and two side brushes to clean the front, rear and vertical surfaces. Other types of automatic car washes include a rollover or in-bay (the car is stationary while the wash equipment moves over the car) and a conveyorized tunnel (the conveyor pulls a car through the wash equipment), according to Lash. No matter the type of car wash, there are several factors to keep in mind, including water usage and water recovery. 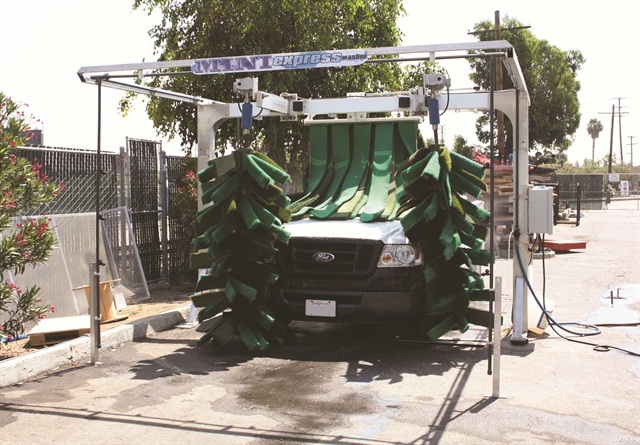 What are other factors to consider when setting up an automatic car wash or hand-washing area? When setting up a car wash, car rental facilities need some type of water containment system. The federal Clean Water Act sets water quality standards for contaminants in surface waters. It is illegal to release any type of pollutant into navigable waters, including soap and dirty water from car washes. Know the location of your sanitary sewer line, because this is where your runoff will flow. Each city charges a certain tap fee to tie into the sanitary sewer, says Lash. Install a filter to collect water and waste. For example, Choice Auto Rental, serving Minneapolis/St. Paul, installed a sand trap and hazardous waste filter in its wash areas, says McKenzie Spalding, director of operations. To adhere to California regulations, Sam Zaman of Black and White Car Rental in Beverly Hills must have a clarifier in his car wash to trap the water and remove any solids. Set up a containment mat to collect the water and reuse it. A system from GEOMAT captures waste-water runoff, filters it and then either pumps it back into the system for reuse or sends it to the city’s sanitary sewer line. Payless Car Rental in Philadelphia uses the GEOMAT system to capture wastewater runoff, filter it and pump it back into the system for reuse. Payless Car Rental serving Philadelphia International Airport installed the GEOMAT system upon moving into its new location. After collecting in the mat, the water flows into a filtration system, fills up a holding tank and then goes through a pump to reuse for washing cars. 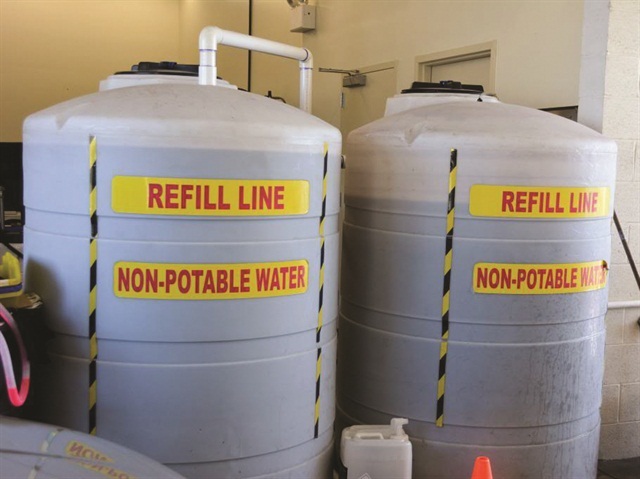 The system recycles 1,000 gallons of water that are used for two weeks before being drained, says James Easley, vice president of three Payless franchise locations in greater Philadelphia. “Currently, the water bill is $70 a month. It used to be $150 to $160 without the system,” he says. Before installing a car wash, operators should first ask, “Do I have enough space?” Space and location can be a big issue, especially for neighborhood car rental locations. For a drive-through, rollover or compact conveyorized tunnel, a standard envelope for the wash bay itself is 30 feet long by 16 feet wide. If an equipment room is needed, add 8 to 10 feet in width, says Lash. Keep in mind that dimensions vary depending on the size of the system as well as the region’s climate. In colder climates, the equipment will need to be completely enclosed under a roof — requiring a longer wash bay. If space is at a premium, an alternative set up would be similar to those found at self-service car washes, where a standalone unit provides a high-pressure soap, rinse, wax and air dry. Operators need to make sure their facility’s zoning permits allow a car wash. Additionally, check building codes. According to Lash, property setbacks can restrict available space. Space also comes into play for hand washing vehicles. There needs to be space to install a cover to protect the wash area drain. By keeping the drain covered, rainwater can’t flow as easily into the sanitary sewer and cause an overflow, says Al DeChard, CEO of GEOMAT. For example, if your wash area is 10 feet by 20 feet, the roof needs to exceed all sides by 2 feet. Carports or temporary awnings can also work as a cover. Before being reused in Payless' car wash, the water flows into a filtration system and then is stored in these holding tanks. With a variety of soap products available, what are the best for washing cars? DeChard recommends using an environmentally safe soap with the lowest pH. Stay away from petroleum or oil-based cleaners. Don’t just pick up dish washing soap. When scrubbing with a brush, the soap needs to produce some type of lubrication to avoid scratching the vehicle, says Lash. For hand washing, a water-restricting tool could help reduce your water bill. Lash recommends adding a low-flow nozzle to a garden hose or purchasing a pressure washer. To reduce drying time, Black and White uses an deionized water system that self-dries and doesn’t leave water marks. Rely on the product’s vendor to instruct you on proper use and storage, DeChard says. Although washing by hand will require a bigger team of car washers, an automatic car wash unit will still require some supervision. DeChard found his most valuable washers through a local halfway house. Not only did they have regular drug tests, they were reliable and showed up for work. If there were problems, the halfway house administrators were good intermediaries, DeChard says. With the often high turnover associated with this entry-level position, an operator may need to offer some incentives. Take Sharon Faulkner, a former Dollar and Thrifty franchisee, for example. If a car washer completed everything on the company’s clean sheet checklist — and it was approved by a manager — the washer received a reward of $1 to $2 per car on a weekly basis. This reward program helped weed out the slackers, says Faulkner. This schematic shows a top-down view of a drive-through automatic car wash. Note the minimum 16-foot width and 40-foot length. Drive-through washes are capable of handling 50 to 55 cars per hour. Courtesy of Sonny's The Car Wash Factory. Frank Lash highlights three common types of automatic car washes. Each of them uses a friction cleaning method — a car is washed with a soft cloth or closed cell foam wash material that comes into contact with the car’s paint surface. Car is stationary while the gantry passes back and forth over it. Each step of the wash needs at least one pass of the gantry forward or backward. Cycle time: A basic wash with no extra services lasts about 4 minutes — washing a maximum of 15 cars per hour. A wash with extra services lasts about 6 minutes, or maximum 10 cars washed per hour. Price Range: $67,000 (with no air dryers or ancillary equipment) to $190,000 (with air dryers, extra service options, spot free rinse, reclaim and pay station). Car is driven slowly through the wash equipment; the vehicle maintains its position by keeping the left tire in a fixed guide rail. It is a quality basic wash with no extra service applications. This type of system is used in car rental facilities not available for public use. Cycle time: A drive-through unit can wash a maximum of 50-55 cars per hour. Price Range: $54,000 (with no air dryers or ancillary equipment) to $121,000 (with air dryers, spot free rinse, reclaim and simple entry system). A conveyor pushes or pulls the car through the wash unit. This type of system is generally seen in public retail car washes; its length ranges from 35 feet to 200 feet long. It can be designed in a basic form with no extra services or created with multiple service add-ons. A conveyor controls the speed that the vehicle moves through the wash components; therefore, adding extra services doesn’t increase the wash time. Cycle Time: Smaller systems can wash 50-55 cars per hour, while larger conveyor systems can wash as many as 180 cars per hour. Price Range: $156,000 (with no air dryers or ancillary equipment) to $800,000 (with air dryers, spot free rinse, extra service options, reclaim and pay stations). Provided by car wash consultant Frank Lash, here are some factors to consider when setting up a hand car wash and an automatic car wash. Location: Space for a separate washing area, which limits the possibility of a customer walking into the wash area. Climate: In most climates, a type of cover or shade is needed. For cold weather, the wash area needs to be enclosed for parts of the year. Water recovery: A wash floor that pushes water to a central drain, which is tied into a sanitary sewer. Or a water recovery mat that collects water for putting into a sanitary sewer. Water use: To reduce water usage, add a low-flow nozzle to a garden hose or use a pressure washer. If you are using a hose, a hose reel can help keep the work area neat. Chemical control: An automated dilution system to safely mix chemicals. Provide a material safety data sheet for every chemical. Wash materials: To avoid trapping dirt in the brush, use hogs hair or soft brushes. 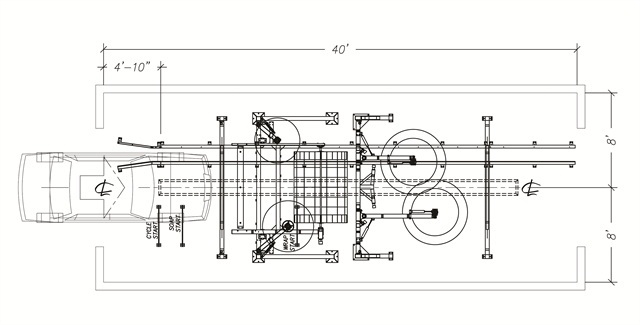 Space: For a drive-through, rollover or conveyorized tunnel washing unit, the minimum dimensions are approximately 26 feet wide by 30 to 45 feet long. Zoning: Is a car wash allowed on the facility’s property? Climate: In colder climates, car wash units will need to be enclosed with automatic doors and a heating system. Water meter: Most car wash units require at least a ¾-inch to 1-inch water meter and generate a one-time permit fee. In Virginia Beach, Va., a facility is charged $8,170 for a 1-inch water meter. Tap fees: A facility will be charged a tap fee for tying into the city’s sanitary system. Fees differ by city and can range from thousands of dollars to hundreds of thousands of dollars. Water recovery: A wash bay must be designed for water to flow directly to the sanitary sewer or to a reclaim system that channels overflow to the sanitary sewer. Electrical: Depending on the unit, a car wash could require 200 to 400 amps to operate. If more electricity is needed to power the car wash, additional electric services would need to be provided by the power company.